I was innocently pushing my cart through the grocery store while shopping for the healthiest of foods. It was all going well when suddenly from one of the nearby end caps I heard tiny whispers of chocolatey seduction. I started to move quickly away but made the mistake of looking over my shoulder towards the promises of taste bud bliss. What the?!?!?! It was too late, I was caught in the neon glow of sugary goodness. 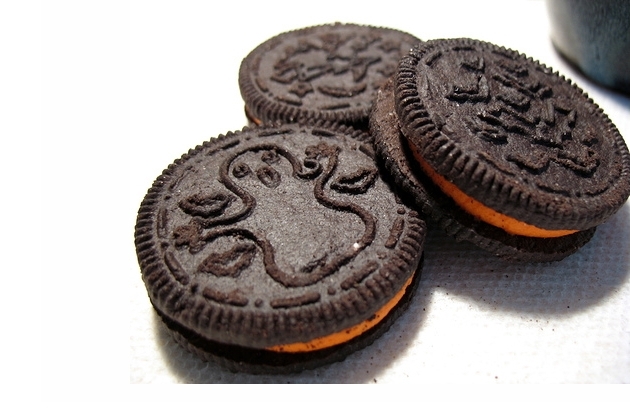 Delicious Oreos with neon ORANGE cream filling. I love things that are orange. I love delicious chocolatey Oreos. Combining the two creates something that I could not walk away from. I had to let a package jump into my cart and join me in the car ride home. I was able to ignore the siren song of the fantastic treats last night. I thought about inviting people over so that I wouldn't be tempted to eat the whole pack on my own. I almost did it but the thought of giving away such treasures was too much to bear. I resigned myself to the knowledge that it is me against the black and orange temptresses in their little plastic house. The key is to devour eat them in one sitting moderation. Tonight I decided to put myself to the test. Could I just eat four Halloween treats? The answer is YES! Well, so far yes, I may wake up in the middle of the night or sleep walk to the sinfully delicious cookies. Who knows for sure until the dreaded sun comes up way too early in the morning. While I pulled apart the cookies and ate them in pieces, one dog slept (knowing he would get none) and the other dog relaxed while keeping an eye on me (hoping that I would lose my senses and give up a crumb.....fool). I am also enjoying a Blue Moon Harvest Pumpkin Ale. Pure freaking heaven of a night! What about you? Are you drawn to Oreos or other cookie treats? 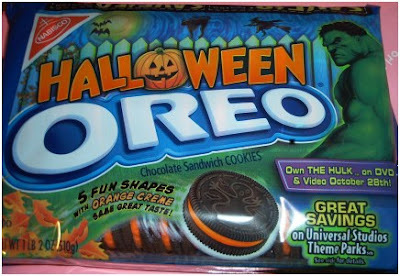 Do the odd holiday versions make you want them more or less?